Inserted and Deleted are One Table? Inserted and deleted tables are 2 pseudo tables preseting the before and after images of modified rows. They can only be accessed from within triggers. Those two have been around for quite long time but it’s hard to find any articles to tell how they are populated. Some rumors said they are retrieved from transaction logs in SQL Server 2000. Recently, I was asked to evaluate the performance impact of using trigger for my customer’s project. I did some investigation and got some interesting results. The first, let’s create a table with some data in an user database. Note that I don’t have any code doing anything within the trigger. The next, we will need to setup SQL Server Profiler to capture Lock:Acquired and Lock:Released. Those two will tell you what locks are granted and released on the resources (rows, pages, extents, etc.). When an X lock applied to a page, you could make an assumption that the page is possibly modified internally by SQL Server. After the profiler is setup and running, let’s run code below. 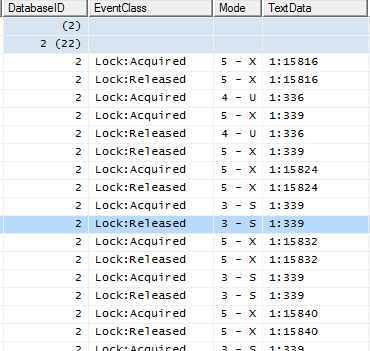 Here are what in the trace: Extent 1:15072, 1:328, and 1:329 in tempdb are “touched” by SQL Server. Use DBCC Page command to check the content of those pages in tempdb. Page 328 and 329 are IAM pages. The result of page 15072 is very interesting. 0000000000000014:   000a0000 00000000 0000002f 00000000 01260000  .........../.....&..
0000000000000050:   79797979 79797979 797a7a7a 7a7a7a7a 7a7a7a04  yyyyyyyyyzzzzzzzzzz. 20 records are in the page. Em… I wouldn’t be surprised since we should have 10 records in inserted table and 10 in the deleted table in this case. Surprisingly, Deleted and inserted tables are just in one physical storage structure in tempdb and records for inserted and deleted are interlaced! (It’s impossible for SQL Server to use one data page to host 2 physical tables.) So, inserted and deleted are 2 logical tables where the data is derived from one physical table. The size of the record is 102. I cannot wait to dump the records in the test table by DBCC Page. (To save some words, I don’t post the result of the DBCC command here) The size of the record in test table is 41. The record in tempdb includes all bits in the records in the table in test table. 61 bytes of overhead are added for each row. I wonder what would happen if the size of the record in my table is the maximum record size – 8060? Will the trigger stop working? 0000000000000028:   e6020000 00009900 00000000 00000057 f5fe0700  æ..............Wõþ..
0000000000000064:   50505050 50505050 50505050 50505050 50500600  PPPPPPPPPPPPPPPPPP.. This is a record in deleted table. Size of the record is 8061. 61 bytes of overhead is added as well. Wait, it’s not just 61 * 2 bytes of overhead…In this case, SQL Server actually adds one page overhead for one inserted or deleted record in tempdb, which means you need to spend 2 pages for one record if your base table record is big. It sounds pretty negative. But it does not mean you should not use triggers. In most of the OLTP system, data modification is not as significant as data reading. Sometime, when the size of the record is small and changed records are just few, SQL Server does not spill the data to tempdb. (At least I saw the cases that locks are not granted to any pages in tempdb). What about the INSTEAD OF triggers? It behaves slightly different than AFTER triggers. You can use the same way to figure it out. I had a lot of fun on this topic with my coworker who worked with me on this research and provided valuable suggestions and comments. This is brought by John Huang, http://www.sqlnotes.info. It’s documented (http://msdn.microsoft.com/en-us/library/ms175492(SQL.105).aspx) that triggers use the version store in tempdb (append-only storage units and so on) that’s all you’re seeing here, isn’t it? It mentioned that triggers use tempdb for inserted and deleted tables. But it did not say how they are stored, overhead, etc. I was surprised by the statement: “Inserted and deleted tables are 2 pseudo tables preseting the before and after images of modified rows. They can only be accessed from within triggers.” as I have always assumed the OUTPUT column list clause on MERGE, INSERT, UPDATE and DELETE (e.g. DELETED. * and INSERTED. *) were sourced in the same way as a trigger returns those values. Back when sql 2000 was the standard, the maximum size of a row was 8060; We had a table which if you summed the maximum sizes of all the columns together was larger than that, but none of our clients ever used enough of the space in all the various columns to exceed the limit! Anyway, we had a trigger on the table using the inserted/deleted tables, and never had any problem with it. Given that in sql 2005 a row can break a page, and in 2008 a column can break a page, I would expect there is capability available which will inserted and deleted tables to function in like manner in these and later versions of sql.